QUEEN VICTORIA, second type, 1860. Re-entered 0 in date, minor surface marks, full mint bloom, obverse rim bruise at 9 o'clock, otherwise nearly choice uncirculated and very rare in this condition, one of the finest known. Ex Noble Numismatics Sale 94 (lot 1393). 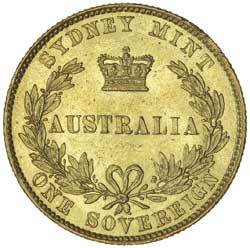 QUEEN VICTORIA, second type, 1858. Nearly very fine. 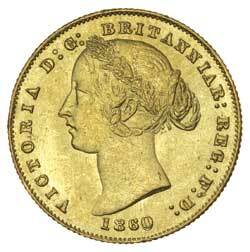 QUEEN VICTORIA, second type, 1861. Good very fine.